One of my favourite South African online casinos has just had a makeover. Thunderbolt Casino has a new homepage that’s cleaner, more modern, and easier to find games and casino bonuses. But what I like most are the free spins hidden all over it! Thunderbolt's new homepage filters promotional information so that we see only what’s appropriate for us. And it makes it much easier to browse all the hundreds of games from Realtime Gaming that are now available. South African casino's new homepage makes it easier to browse games from Realtime Gaming and casino bonus offers. To encourage us to explore the new site, Thunderbolt has hidden bonus codes for free spins on games like the new Nova 7s, Panda Magic and Witch’s Brew all over it. 1. Thunderbolt is always there to help. Find out how and you’ll uncover a hidden free spins bonus. 2. 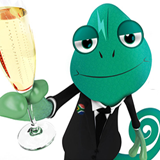 Read how Thando the Chameleon got to his name to discover free spins on another game. 3. Amidst all the different casino bonuses on their new Promotions page some free spins are hidden. Another new feature on Thunderbolt’s new homepage is the Hottest & Coldest Games update. The hottest game is the one game that’s currently being played the most and the coldest game is the one played the least. Last month, as Halloween approached, the witch-themed Bubble Bubble slot was the Hottest. One of the casinos most popular games for a long time, Alladin’s Wishes is currently the Coldest Game. Thunderbolt has a huge selection of real money online casino games from RTG. They’re all played in Rands and customer service is available in both English and Afrikaans. Thunderbolt’s mobile casino was recently voted Best Mobile Casino in a survey of South African players.